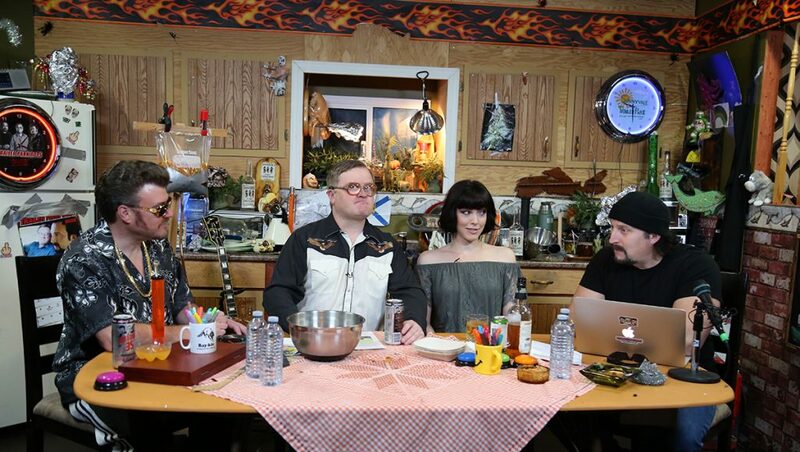 The Boys often worry about offending their lady guests but they can be themselves on the latest episode of the Trailer Park Boys Podcast because their guest is a chicken finger-eating, whisky-drinking, kitty-loving musician named Elise LeGrow! The Boys pour LeGrow some Liquormen’s and they chat about her collaborations with Ron Sexsmith, as well as her upcoming album Playing Chess, where she rips out some DECENT covers from the Chess Records catalogue. Bubbles brought his guitar, and he accompanies her for a live performance! They also chat about KFC bath bombs, gay lions, and who would win a hypothetical battle between a coywolf and a raccoon dog! Elise is on all the fackin’ social media – Twitter, Facebook, Instagram, and you can search the hashtag #OliveLeGrow on Instagram to check out her kitty! PLUS: Ricky has a plan to snack during the podcash but not make any annoying chewing sounds… and it is FUCKED!